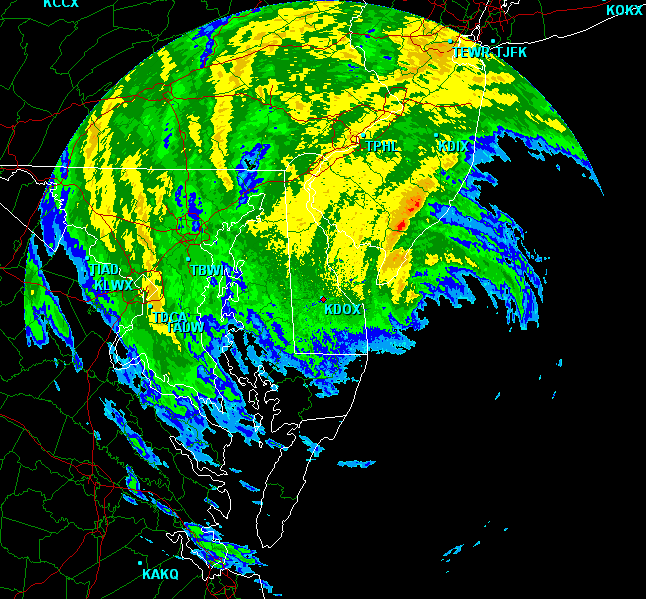 For those of you awake and with power. . .Hurricane Irene is now east of the Delaware Bay and moving almost due north towards Atlantic City. The storm will continue to move in this general direction during the next two hours. It is possible that it will make landfall in or near Atlantic City during this time. The highest wind gust I have seen is 71 mph in Seaside Park on the backside of a rainband. The worst of this storm is going to be during the next 3-4 hours for the Jersey shore, unfortunately coinciding with high tide. Please stay indoors and away from windows. Winds will continue to increase to 50-60 mph with gusts to 70-90 mph possible. There are already many power outages and I expect this to continue overnight. The tornado threat should be dwindling as the eye passes. DC up to Philadelphia should see the rain ending during the next few hours, but winds will continue to increase as there is a pressure rise in the wake of the hurricane which is allowing for winds to gust up to 60 mph or higher. Power outages may continue into the morning hours. Praying for all of you there. Been there done that. Let us know how you are.